Tomorrow, July 11, I will be presenting, “The Postcards of Charles Cleaves: Images of Rockport from 1907-1937,” a presentation highlighting some of the hundreds of Rockport postcards published by Charles Cleaves and his Rockport Photo Bureau, whose pictures capture a remarkable record of Rockport a century ago. I will share a selection of Cleaves’ postcards, ranging from simple street scenes to majestic vistas. The free program is sponsored by the Sandy Bay Historical Society and begins at 7:30 p.m. at the Rockport Public Library. The origin of this real-photo postcard is a mystery, but the person it pictures is not. More about the mystery later, but first some information about the person. Sally Stockman Tarr was a descendant of Richard Tarr, Rockport’s first settler. She was the daughter of Sally Tarr and John Stockman. The elder Sally Tarr, born in 1788, was a fifth-generation descendant of Richard Tarr. The elder Sally was the daughter of Jabez Tarr, who fought in the Battle of Bunker Hill on June 17, 1775, and his second wife Peggy Somes. John Stockman was originally a mariner and then a farmer. Sally and John married on Jan. 28, 1805. Sally died in 1844 and John later married Mary Parkhurst, the widow of John Wonson. John Stockman died on May 30, 1858. Both John’s gravestone and Sally’s gravestone can be seen in the Old First Parish Burying Ground. Sally Stockman Tarr married Charles Tarr, who was also a fifth-generation descendent of Richard Tarr. Charles was born on Dec. 22, 1805, and died July 2, 1878. Sally and Charles were married on Dec. 23, 1830. Charles was the son of Benjamin Tarr (born 1767) and Lucy Pool. Charles William Tarr, born September 29, 1831, in Rockport, and died November 13, 1895, in Gloucester. Benjamin Tarr, born July 29, 1833, in Gloucester, and died November 30, 1895, Gloucester. Benjamin married Alice Whalen and was a carpenter. Silas Stockman Tarr, , b. May 19, 1836, Gloucester, Essex, Massachusetts; d. April 08, 1922, Gloucester, Essex, Massachusetts. Lucy Maria Tarr, b. March 30, 1840, Rockport, Essex, MA; d. May 19, 1924, Gloucester, Essex, Massachusetts. Mary Bartlet Tarr, born May 08, 1844, in Rockport, and died February 10, 1927. Mary married George Dorman, a railroad engineer. Albert Bradford Tarr, born March 18, 1847, in Gloucester, and died March 21, 1853. Sarah Sayward Tarr, born March 09, 1848, and died July 05, 1849, in Rockport. Orren Somes Tarr, born February 24, 1855, in Gloucester, and died June 15, 1923. As mentioned, this is a real-photo postcard, meaning it was printed directly from a photographic negative, not through a commercial printing process. There were various brands of real-photo stock. The stock on which this particular postcard was printed was produced from 1906 to 1915. However, Sally Stockman Tarr died on Feb. 10, 1892. Thus, this postcard was produced at least 14 years after her death, possibly even more. It would therefore seem that someone created this postcard several years after Sally’s death using a negative of a photograph taken while she was still alive. Perhaps the postcard was made as part of a memorial service for her or simply as a family remembrance. If you are at all interested in the Tarr family history, there is a website that traces the Tarr family genealogy in detail. Information about Sally Stockman Tarr can be found starting on this page. John Stockman, b. September 07, 1805. James Stockman, born September 20, 1807. James died on October 21, 1826, when he was drowned at sea. Lucy Pool Stockman, born March 10, 1812, and died October 26, 1826. Anna Maria Stockman, born October 22, 1814, and died September 02, 1848, in Hamilton. Silas Stockman, born November 09, 1817. He later married Martha Maria on October 23, 1841. Margaret S. Stockman, born September 09, 1820, and died October 11, 1842. She married John James Giles on April 11, 1840, in Ipswich. Marinda Stockman, born January 24, 1823. Mary Stockman, born June 27, 1825, and died February 16, 1853. James Stockman, born August 31, 1828, and died November 27, 1858. Lyman Beecher Stockman, born November 13, 1831. Lucy Pool Stockman, born November 24, 1834, and died April 30, 1839. Hard to say whether this serious-looking group is enjoying what must have been a day trip to Thacher Island. It looks like they might have just finished lunch, as there seems to be some sort of pot on the ground and two boys in the background are swigging something from bottles. 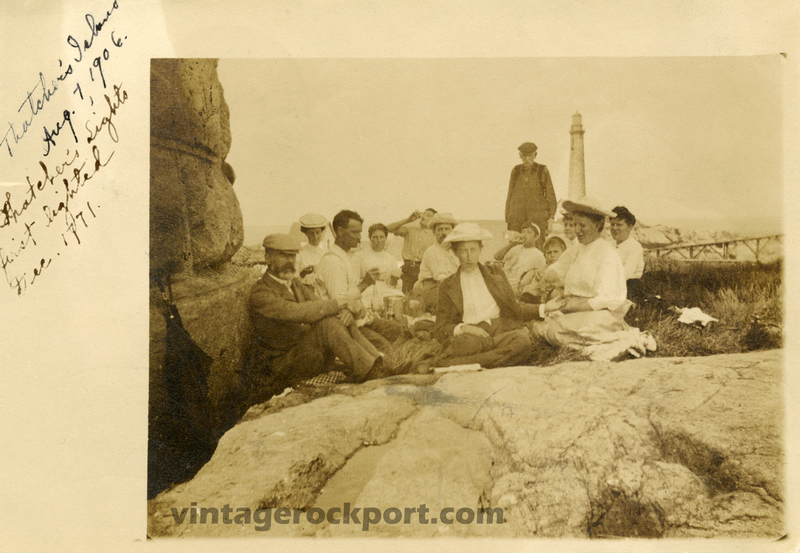 The man on the left is leaning against the base of one of Thacher’s twin lighthouses, and it looks like there is an umbrella or two also leaning against the base. This is a real-photo postcard, meaning that it was printed on postcard stock directly from a negative and not through a commercial printing process. Real-photo postcards can be one of a kind or one of several printed from the same negative. The inscription on the left tells us that this photograph was taken on Aug. 7, 1906, and notes that Thacher’s lighthouses were first lighted in December 1771 (although the present-day granite towers were not completed until 1861). The card was mailed from Boston, Mass., to Geneva, N.Y., on Jan. 3, 1907. This beautiful image of the Twin Lights on Thachers Island bears the inscription, “Copyright 1905, Martha H. Harvey, Annisquam.” I have another of Harvey’s images in a postcard from 1897 showing the Annisquam River. Note that the postcard also references the Turk’s Head Inn, so perhaps it was produced for the inn. Harvey, who lived from 1862 to 1949, was an artist and naturalistic photographer. 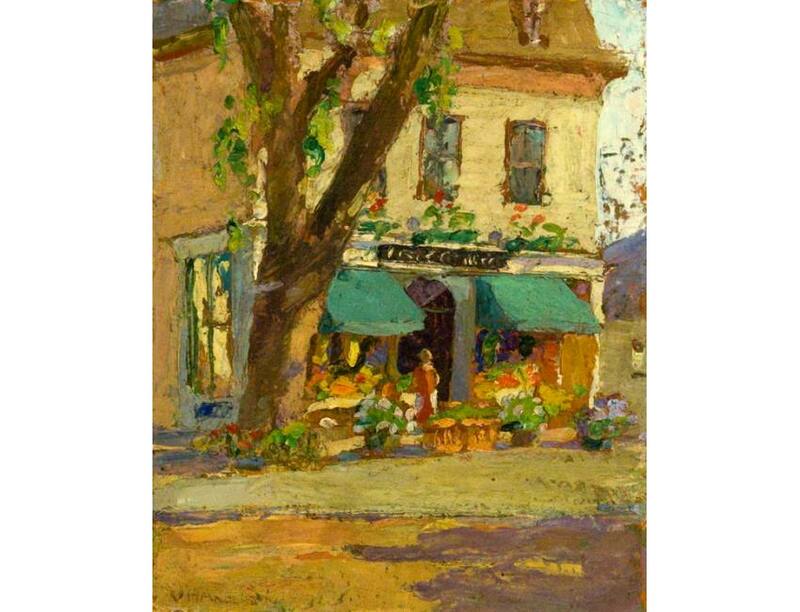 She and her husband, the artist George Wainwright Harvey, lived on River Road in Annisquam and had side-by-side studios there. Harvey made her living primarily as a photographer, using an 8-x-10-inch camera to produce hundreds of large-format photographs of Gloucester and Cape Ann. The majority of Harvey’s glass-plate negatives were acquired by Yankee magazine. In 1994, the magazine donated them to the organization Historic New England as part of a collection of more than 2,000 negatives showing New England from the 1890s to the 1930s. In a reader’s comment to my prior post about Harvey, Chris Shattuck tells a story from the 1960s about how his Annisquam neighbor, Elliot C. Rogers, had come into possession of Harvey’s negatives and of how he convinced Yankee magazine to purchase them. George Wainwright Harvey, who lived from 1855 to 1930, is described on Cape Ann Museum’s website as one of Cape Ann’s most skilled native artists. According to an 1883 newspaper article about an exhibition of his watercolors, he was “a young Gloucester fisherman whose only instruction in art was gained by watching the artists whom he took out in his boat.” In 1886, George and Martha traveled to Holland so that he could study painting. As this postcard documents, a major nor’easter hit the Massachusetts and New Hampshire coasts on Wednesday, March 4, 1931, bringing snow, howling winds and the highest tide in 21 years. The Boston Globe called it the most destructive storm since 1898, reporting that hundreds were made homeless, scores were rescued on the North and South Shores and at Hampton Beach, N.H., and nearly $1 million in damage was caused. The Boston Globe report did not specifically mention Rockport, but it said that damage was extensive all along the North Shore, with Nahant a virtual island, Salem’s streets flooded, and surf having reached a hotel’s second floor in York Beach, Me. Never has New Hampshire’s seacoast been so devastated as by the storm and terrific tide of Wednesday morning when mountain-high surf literally lifted cottages into the air, throwing them aside like a bunch of kindling, nothing left worth salvaging. Remarkably, just four days later, on March 8, a second nor’easter again battered New England. This second storm, the Boston Globe reported, “did little damage other than spread the debris” of the March 4 storm, but it nevertheless created such a “pounding, roaring sea” that roads were clogged with “surf-gazers” all along the North Shore. 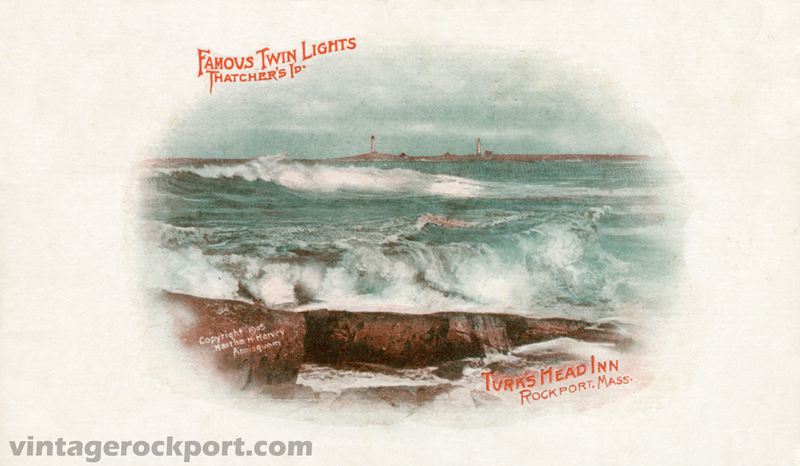 This postcard, from Rockport Photo Bureau, shows the surf from the storm hitting against the seawall at Front Beach. It was postmarked on June 24, 1931, indicating that Charles Cleaves, the owner of Rockport Photo Bureau, wasted no time in getting this card printed and in stores. The caption of the postcard says the picture is on Beach Street near F0’Penny Knoll. That name refers to the rocky outcropping at the north end of Front Beach where the gazebo is located. Join us this Tuesday evening, Aug. 9, for a slideshow presentation of postcards from this blog and from my collection. The presentation will be at 7:30 p.m. at the Rockport Public Library on Broadway. 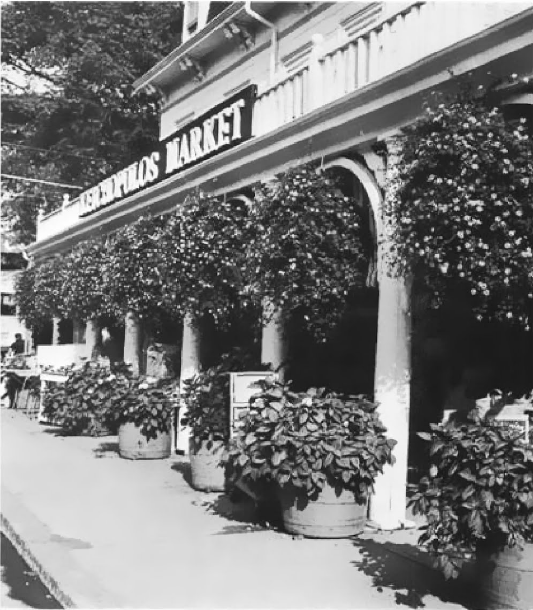 The event is sponsored by the Sandy Bay Historical Society.